My regular reader knows well that I am slightly obsessed with the great Finnish writer Tove Jansson, whose Moomin books I enjoyed as a child and whose more mature fiction I have equally enjoyed in recent years. (And I also marvelled at her father’s statues of her.) 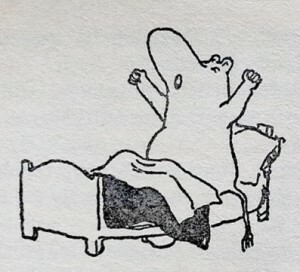 So I have returned to five of the Moomin novels - not all, and a slightly arbitrary choice - to see if the magic remains. And, by and large, it does, as I will explain below. I must, however, register a serious disappointment with my Puffin editions, bought in 2017. Each has a boilerplate biography of Tove Jansson onside the front cover, stating that “She lived alone on a small island in the Gulf of Finland, where most of her books were written.” This completely erases her partner Tuulikki Pietilä; they were together for fifty years. 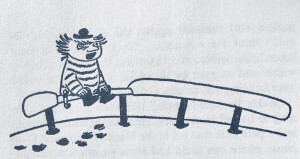 It wasn’t really OK for Puffin Books to print this untruth in 1967, when they first published Comet in Moominland, and it is definitely not OK now. I hope that they will amend this as soon as possible for future printings. 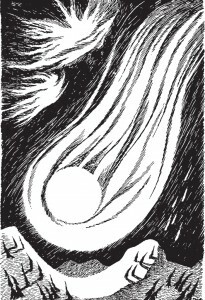 This was the first full Moomin novel, pubished in 1946 but written in the shadow of war, and it’s not too difficult to see the metaphor of the world-altering disaster threatened here in the shape of a comet aproaching the Earth. Against this ominous background, Moomintroll, who is the central character of most of the Moomin books, along with Sniff (who fulfills a younger sibling role) and Snufkin (the Best Friend) go to the Observatory to ask advice from the Astronomer. On the way they make friends with two more siblings, the Snork and the Snork Maiden. After a series of adventures (including a dragon and a carnivorous tree), they get to the Observatory and there the Astronomer nonchalantly informs them that there is no hope - the comet will destroy everything. They return home across a devastated landscape with scurrying refugees, and at the last moment as they prepare for the end, all comes right and the world is saved. This is bleak and scary stuff for the young target audience, and I remember being chilled by it as I first read it. At the same time there is always a sense that Moominmamma and Moominpappa will provide security in an uncertain world, the tale is told with plenty of humour, and time is found for parties and good food and drink (mostly coffee of course). It is beautifully illustrated by Jansson herself (as are all the Moomin books). It’s clearly an early work - rather episodic, despite the grim over-arching narrative, and without the attention to character that we would get later on. So I think a younger child would enjoy it most, but there is plenty for us grownups too. You can get it here (not the lesbian-erasing Puffin edition). ”Unpardonable!” exclaimed the Muskrat unwinding the rug from his legs. I think this is my favourite of the books. It is the only one that has the nuclear Moomin family (mostly) on home base, their lives interrupted and enlivened by a new element - so it combines Farah Mendlesohn’s immersive and intrusive modes of fantasy. 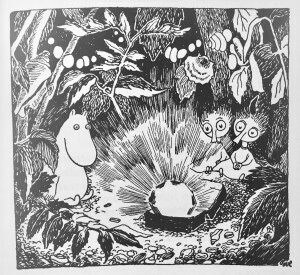 The disruptive element is the Hobgoblin’s Hat, which Moomintroll, Snufkin and Sniff find in the first chapter. 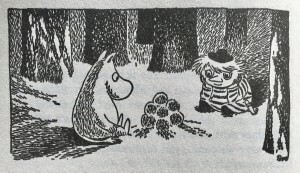 The Moomins use it as a rubbish basket at first, and only gradually realise that it transforms everything that it put into it - including Moomintroll himself, until his mother recognises him and her love transforms him back. The Hat also transforms words from the dictionary into creepy crawly creatures. The book also introduces Thingumy and Bob, an enigmatic pair who share a special language and have a secret that they are reluctant to share with anyone (but which brings them danger from the Groke and the Hobgoblin). They are generally interpreted as Tove Jansson’s version of herself and the first woman she loved, Vivica Bandler. In the end their secret is revealed, and it turns out all right. The whole story wraps up very nicely, with the inevitable party. I think this would be a good introduction to the Moomin books for a reader of any age who was not sure where to start. You can get it here. ”We simply can’t take the whole drawing-room suite,” said Moominpappa. 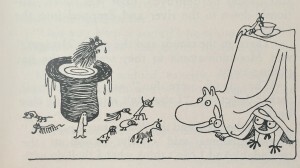 The Moomins get washed out of their house by a flood; Moominmamma and Momminpappa (and a host of other small creatures) take refuge in what turns out to be a theatre - initially to their total bemusement, because they have no idea what a theatre is; but it doesn’t stop Moominpappa from writing a play. 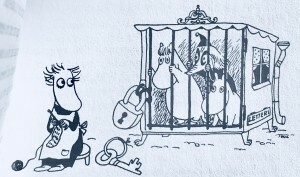 Meanwhile Moomintroll and the Snork Maiden have been separated from the rest of the household and have a series of edventures culminating in a jailbreak with th neurotic Fillyjonk. (The Snork Maiden’s brother seems to have been written out.) This book possibly draws most on Tove Jansson’s own somewhat Bohemian upbringing. 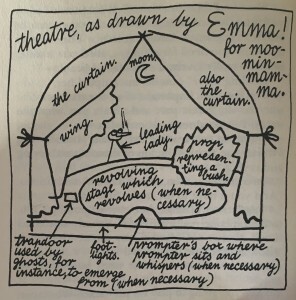 Her father was a famous sculptor, her mother was an artist too; and she herself had a strong attraction to the theatre (Vivica Bandler was an actor) and was closely involved with the stage adaptations of the Moomin stories in her lifetime. But here she is at least partly laughing at herself, and looking at the theatre through the eyes of characters for whom it is completely new. It’s played for laughs a bit more than the other books (though there are a couple of rather sad characters, to offset the jollity). You can get it here. Every so often they struck, and now and then the alarm clock went off. It comforted him. But he could never forget the one terrible thing — that the sun didn't rise any longer. Yes, it's true; morning after morning broke in a kind of grey twilight and melted back again into the long winter night — but the sun never showed himself. He was lost, simply lost, perhaps he had rolled out into space. At first Moomintroll refused to believe it. He waited a long time. This is my second favourite of the books. Moomintroll wakes up in the middle of winter, while the rest of the Moomin family are hibernating, and must get to grips with a familiar lanscape made alien by snow, and new neighbours and friends. Chief among these is Too-Ticky, a warm yet slightly enigmatic character who is generally interpreted as Tuulikki Pietilä. In her first conversation with Moomintroll, she concludes: “All things are so very uncertain, and that’s exactly what makes me feel reassured.” (Original Swedish: “Allt är mycket osäkert, och det är just det som lugnar mig.”) I love this so much that I used it for my Christmas emails last year. There are some bleak and sad bits here too - the squirrel and the Groke; the dog Sorry-Oo and the skiing Hemulen. But in the end it’s a story of renewal and reassurance. You can get it here. ’Who would have thought they could be so ferocius,’ said Little My, full of admiration. 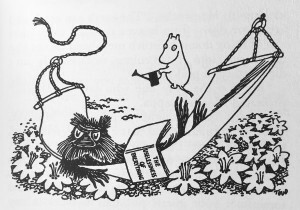 Another misleading title (though this goes back to the Swedish original), as the story concerns not just Moominpappa but the entire family and various associates, heading off to an island for a summer adventure. 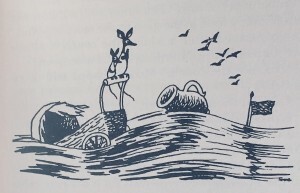 A lot of this is obviously drawn from Tove Jansson’s own warm experiences of the islands, both as a child and as a guardian of children, which she also used in her lovely The Summer Book. 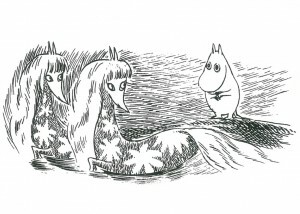 At the same time, it’s also a story about passions and aspirations - Moominpappa wanting to get the lighthouse working again, Moomintroll investing emotional energy in the sea-horses who do not care about him at all. I’m not especially a sailor or a fan of roughing it in an isolated location, so it doesn’t gel for me as much as the earlier books, but there is still a lot of magic. You can get it here. As I said at the beginning, I was really glad to revisit these. I have a couple more on the shelves which I will get to in due course. The Moomin books came to the top of my pile of unread books acquired last year. Next up is The Name of this Book is Secret, by Pseudonymous Bosch. Always a pleasure to read (of) these books. I look forward to Moominpappa's Memoirs and Moominland in November, assuming they are en route? I did the latter back in July! Will get to them all eventually.